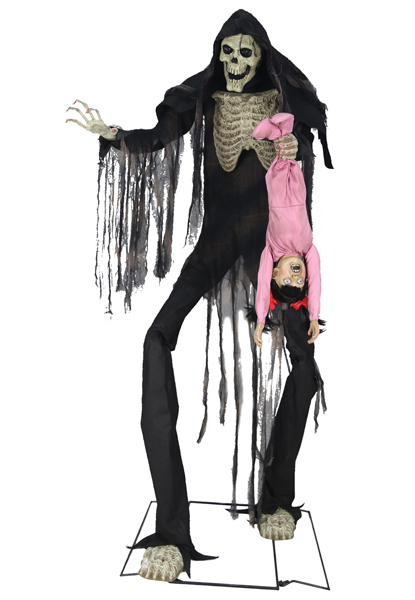 If you are a “Knucklehead” and love Halloween props Home Depot has just thing for you. 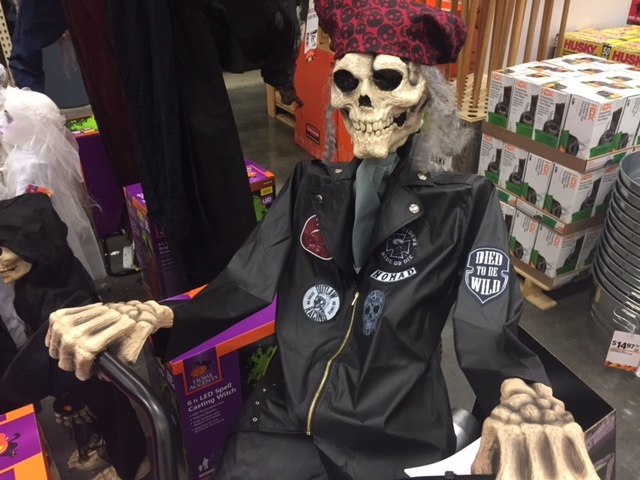 This year Home Depot literally rolled out the Motorcycle Riding Reaper for Halloween 2017. It’s basically a skeleton in motorcycle garb sitting on a bike. It might sound silly but you need to see him for yourself. The Reaper is now available on Amazon.com too. Here’s a video of the Riding Reaper in action. In addition to talking the Reaper’s motorcycle makes a lot of noises like the engine revving and peeling out which is pretty neat for a Halloween prop. The Reaper has some cool patches on his leather jacket that say “Outlaw Racing”, “Died to be Wild”, “Ride or Die, Die or Ride”, “Nomad” and a few others. I’m not really sure what to think about the Motorcycle Riding Reaper. I’m not really a motorcycle guy but I understand he will appeal to a lot of people who are and love Harley Davison motorcycles. It’s a neat concept that hasn’t been done with a Halloween prop. I think this could be one of the hottest things Home Depot has this year due to the fact that it’s geared to a small amount of people who are passionate about motorcylces. They’ll see it and buy it as soon as they see it. The prop is also very kid-friendly. 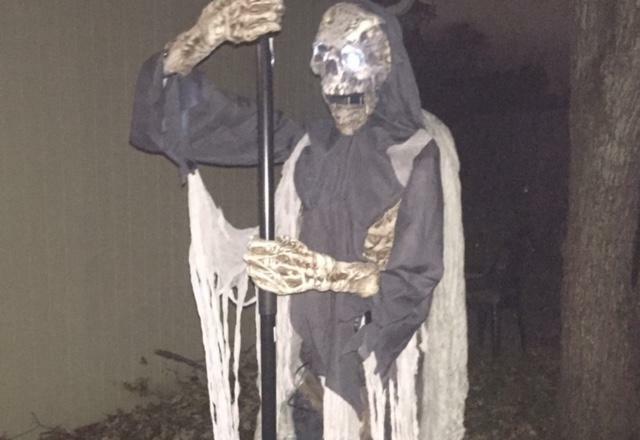 It’s not super scary and is actually something I could see kids come up to if you had him up when the trick or treaters are out roaming the streets on Halloween. You could hook a fog machine up to him and make the motorcycle look like it has exhaust coming out of it. For me, I think I’ll pass on it unless I can find him discounted after Halloween. I’ve got several reapers already in my collection so I don’t think another one makes sense right now. I do think I could put a mask on him and make him a lot cooler once I hid his skull and made him into something a lot creepier. I think if you could somehow make him into a zombie Jax Teller from Sons of Anarchy that would be really neat. 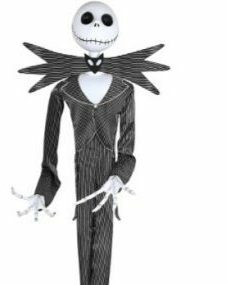 The prop is $199.00 in stores and HomeDepot.com It’s 5.5 feet long and stands almost 4 feet tall. 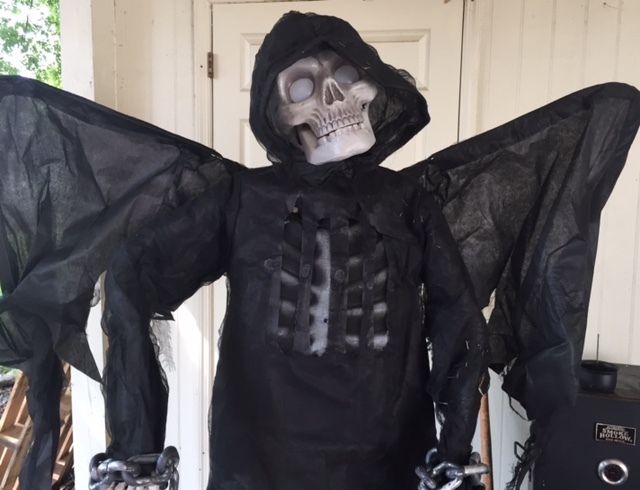 Dropping two hundred bucks on a prop is a big decision but you could wait a little closer to Halloween when Home Depot drops the price 20 or 30%. You can get deeper discounts after the holiday as well.